Jed-Forest continued to impress today when a workmanlike performance over Musselburgh saw them chalk up a bonus point victory at Riverside Park. The win keeps them in touch with the leaders in National Division One, sharing 3rd spot with Dundee, and in line for a play-off place. Having been content to play the opening eight minutes out in their own half of the pitch Jed got down to business with a stylish opener. An exchange between the Young brothers, Gregor and Lewis, took place just inside the Musselburgh half with Lewis handing over to Robbie Shirra-Gibb who wove his way through and touched down. A Brian Walls penalty closed the gap on 18 minutes but it wasn’t long before the hosts pulled away again. A spilled ball on the halfway mark was expertly scooped up by Lewis Young who powered his way up the touchline before passing inside to the ever supportive Shirra-Gibb who duly went over for his second try. The remainder of the half was played out mainly in the Musselburgh section of the pitch and, despite some good pressure by the Jed forwards, it was the backs again who notched the points, this time the distinctive red boots of captain Gregor Young were spotted searing towards the try line. Yet again however it was the hands of Shirra-Gibb that took the ball over the tryline for his, and Jed’s, third score of the afternoon. Gregor Mein slotted the conversion to make it 17-3 to the hosts at the break. Try number four, and a much desired bonus point, came 18 minutes into the second half. 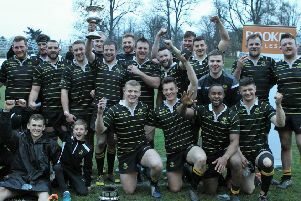 This time the score was a result of some solid forward pressure on the Musselburgh line with scrum half Daniel Ritchie wriggling his way over to claim the honours. Jed were reduced to 14 men eight minutes later when Ritchie was sent to the sin bin for placing his foot on the leg of an opposing player but the lack of numbers did not deter the hosts who already had the victory in the bag. Prop Connor Hogg scored the next try, again following some forward pressure, with Mein slotting the awkward conversion. Musselburgh managed a consolation try on 40 minutes by which time the game was well and truly over as a contest but there was still time for the hosts to grab one more moment of glory with the evergreen Fraser Harkness blasting through for try number six. Mein converted right on the final whistle. Jed-Forest: L. Young; R. Marshall, G. Young, F. Harkness, R. Shirra-Gibb; G. Mein, D. Ritchie; C. Hogg, S. Raeburn, P. Alves Ferreira, C. Skeldon, G. Law, G. Stewart, G. Robson, M. Weekley. Subs: H. Snyman, C. Cowan, J. Hynd, R. Hogg, G. Taylor.